So it’s release day for Patently Absurd, and that means heavy drinking a release day race. Right? Because even though A Day at the Races isn’t anybody’s favorite Marx Brothers film, it’s still a dang site easier to deal with on my blog than Duck Soup or Horse Feathers. I mean, the last time I had Duck Soup over I had marching soldiers singing “Hail, Hail Freedonia” in here for days. Actual days. So we’ll stick with the races this time. It’s all lighthearted fun and wild invention, but Schenck takes a serious turn in the final story, which brings touching depth to his main characters. A great follow-up to Slaves of the Switchboard of Doom (2017). 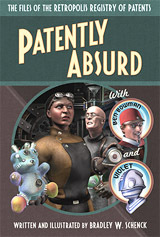 Patently Absurd may not be serious science fiction, but it’s great stuff, and it’s stuffed with the tropes that made the pulp era pulsate like a mutant alien squid, albeit with a nod towards modern sensibilities. Maybe, in its own way, it is serious science fiction, camouflaged as whimsy. No matter what you decide to call it, it’s fun. I wanted to do something with ordinary people whose jobs made them interact with the mad scientists in the Experimental Research District. So I thought about accountants. I don’t think about accountants that often. I mean, you don’t, do you? And of course the real main event on release day is that you can buy the book now in all of the usual places. And once you read it, don’t be shy: please, please, please review it at Amazon, and at Goodreads, and wherever else books are reviewed. 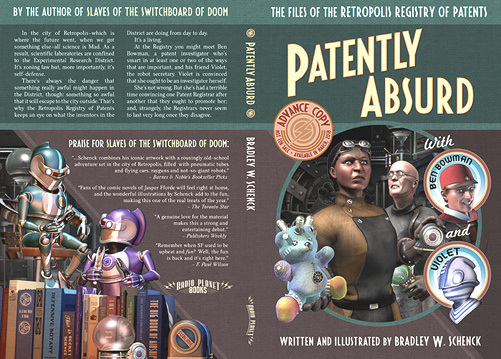 Back around the middle of July, the relentless T-Shirt engine of the Pulp-O-Mizer sputtered and failed. I looked through it. I discovered that figuring the problem out was going to be both complicated and time-consuming. Then I just threw a tarpaulin over it and kicked it a couple of times. I had a lot to do, right then, and I was going to have to postpone the whole thing until my eyes had uncrossed and I could give it some thought. That happened this morning. I wish I could say that I’d been brilliant, but the sad truth is that I tried a gazillion little changes and, once I got it running again, I had no idea which one of them did the trick. Or if it was all of them. But it works now. Huzzah! 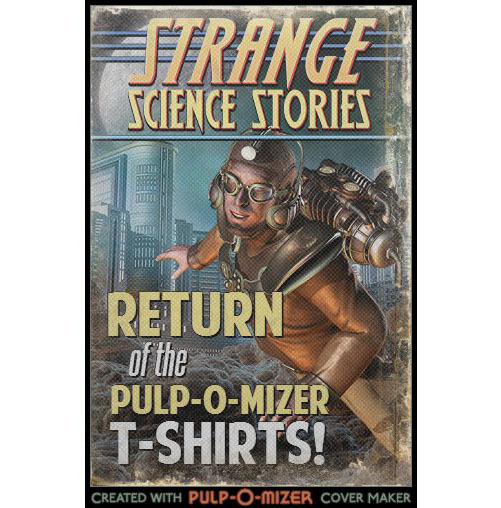 Once again you can get a custom T-Shirt with your very own Pulp-O-Mizer image on it. Just… don’t ask me how I did it. First off, great news: the Patently Absurd fund drive met its primary goal on Day 3. That’s really unexpected, and welcome, believe me. But it’s not over yet. In order to set an attainable goal for the project I moved some pretty important things out to stretch goals. We’re looking at the first of those right now. With the primary goal behind us I’ll be able to send advance copies off to book reviewers and the book buyers for some local bookstores. I’ll also be able to meet some other pre-production expenses, like ISBNs and some setup fees at Ingram. (Ingram Spark will be one of the two printers to produce the final books.) Review copies will be going out to trade publications like Booklist, The Library Journal, and Locus. But there are a couple of other trade publications that are missing from that list. That’s because Publishers Weekly and Kirkus charge fees to review independently published books. They have their reasons. The barrier to self-publish a book is very low, now, and if they take everything… well, everything is a lot, these days. So one can see their point, even if it seems like there might be a better way to deal with what’s now a flood of indie books. 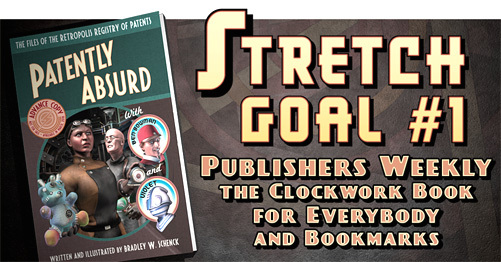 So, at the moment, we’re looking at the first stretch goal for Patently Absurd. At $1400 (just $200 more than the primary goal) I’ll be able to arrange a review for the book at Publishers Weekly. To celebrate, all Kickstarter backers who weren’t going to get a Lair of the Clockwork Book eBook will get one; and everybody who’s getting a print copy of the book will get a pair of custom bookmarks with art from my books. Those are small bonuses, but it’s just another $200, right? And we have 27 days left to go.